Poverty has many meanings: Poverty can be absolute (misery and deprivation) or relative (inequality). 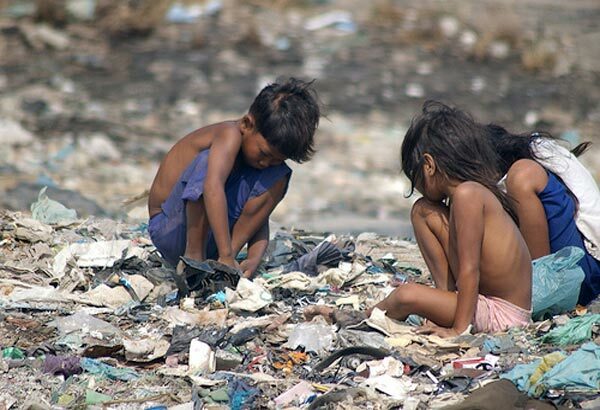 There will always be relative poverty on earth due to the inevitability of at least some degree of inequality: everybody is born in different physical and social circumstances that condition his or her development. As a consequence one has more than the other, one is considered rich and the other poor due to this difference in wealth even though the person considered as relatively poor does not suffer dearth. This form of inequality is perceived as unjust when it arises despite the equal effort of the persons involved: On a level playing field, equal effort should have equal result. Absolute poverty, however, is an appeal to humanity. Suffering must not be tolerated but alleviated as far as it is humanly possible. Furthermore, if absolute poverty is caused by human actions through the intentional exclusion from achieving a de cent livelihood, we perceive it as unfair and unjust. The adequate reaction to this sentiment is justice and charity. Our perception of justice is the basis for our dealing with poverty, both absolute and relative. The basic principles of justice are universally valid and should be made applicable. However, their concrete application depends on specific circumstances and on culture. Our strategies to fight poverty and our perception of justice must be thus aligned in order to be carried out by our society as a whole. All this must be based on a deep understanding of the many dimensions of our sense of justice. One way to fight absolute poverty, which is in line with the performance-oriented sense of justice of the industrialized Western world, is enabling the participation of the poor in the market economy. This means providing the opportunity for the poor to create their own livelihood. Both Pope Benedict XVI and Pope Francis have called for fighting poverty in this way. Latin America can serve as an example. Its specific macroeconomic conditions offer the opportunity to look at the market economy as an instrument to fight poverty in the light of a progressing globalization and the related increased economic possibilities. In our view, Latin America offers in its experience best practice examples as well as cases of dysfunctionalities, which permit us to draw a differentiated picture of the reality of the free market and helps us reflect about the necessary conditions for its functioning. We need to investigate through which means and approaches the global market economy can best fight poverty around the globe. We will especially consider the proposal of ordoliberalism, as it built the starting point for social market economy after World War II, helping to promote prosperity for all. It remains to be seen, however, if such an endeavor can be repeated in our changed global economic situation.